PERFORMANCE AT THE LOGAN CENTER BY Maritzha O. 2018 is full of rap. Such as Drake. Will you like to listen to more? On April 24, 2018, our school, Saucedo, and other schools went to the performance Word Is Rhythm. 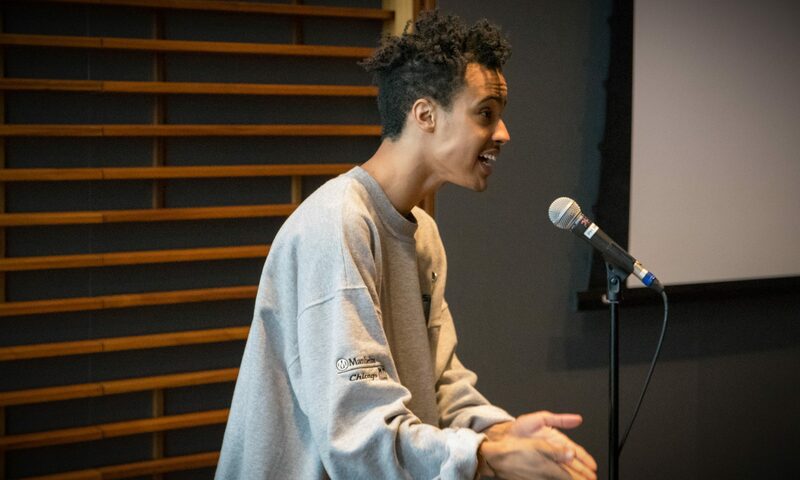 The performance was in the Logan Center of the Arts by the performer Lizzy G. We were there to see a performance about poetry and rap. We were not the only school to see the performance. Every school had students share their poems at the Longan Center auditorium. The auditorium has space for at least 400 or more people to sit. In the auditorium there was a stage where the light was pointed at the performer from above. Each poet got a turn to say their poem. The poet´s showed body language using hand movements. Furthermore, every poet had a different thing to say about their experiences. Many stories about different peoples life. It was very diverse. Also, some poets kind of raised and lowered their voices. Around the room the sound echoed and then slowly you heard dead silence. It really made the experience that much more better. People from our school performed at the Logan Center. Genesis´ and Viridiana´s poem were one of the poems to change my emotions. Their poems were the most touching, since they were about their families. It made the audience kind of feel what they said when they were reading. Their poems were really descriptive and sad. Kind of reminding us that not everything in life is happy. Other poems were about themselves or about their background. One poem was about the poet’s parents, about their way to the U.S. That poem I can relate to since my parents share the same background. Every poem was beautifully written and it was an awesome way to share poems.